I was reviewing my fantasy baseball league’s draft results this afternoon when something struck me… People have no idea when to draft closers, and I need to teach everyone a thing or two about it. Please keep in mind that this post is mostly based on the results from my personal league draft (and league scoring settings, etc), so it might not apply to your league. The free advice I am about to distribute is helpful to everyone though, so just read it and thank me at a later date. How many of you know who the man in this photograph is? If you don’t shame on you. 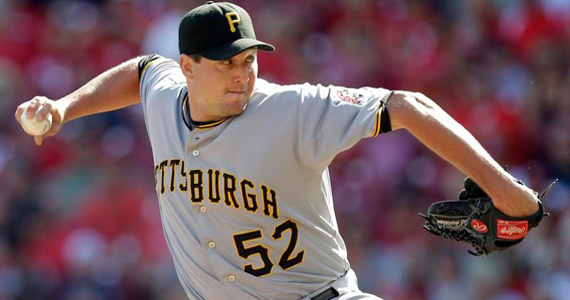 If you have half a brain, you know that this is Pittsburgh Pirates closer Joel Hanrahan. Even knowing who he is, you might be wondering… why the hell is Jobu’s Rum writing about this man? If you’re wondering that, stop doing fantasy baseball. You are wasting your time, energy and money, because you simply don’t have what it takes to win your league. Let me just give you guys a quick background on my league and this post. We carry two reliever spots, and saves is the only reliever specific category. Because of this, relievers carry very little weight in my league. Well, at least they should carry very little weight. I also am mostly focusing this piece on closers drafted by actual draft participants, and not those that were auto-drafted (some jerks in my league didn’t show up for the draft). The first closer drafted in my league was Carlos Mármol with the last pick in the 7th round. That was an auto-draft pick, but I was still pretty surprised. Don’t get me wrong, Mármol is a great pitcher, but I would personally rather have Yovanni Gallardo or Matt Latos. They were the next two picks in the draft. Those are two guys who will help in 5 other categories in my league (I imagine most other leagues too). The first user-selected closer was Mariano Rivera, with the 3rd pick in the 8th round. The person who took Mo missed out on Francisco Liriano, Zach Greinke, Mike Stanton, Jered Weaver, Delmon Young and Dan Haren. The same user then took Joakim Soria in the 9th round, missing out Paul Konerko and Clay Buchholz, among others. So this guy now has 2 of the better closers in baseball. In our league, what will help you more? 120 combined innings from 2 closers (excellent innings), or an elite slugger combined with an elite, young starting pitcher? This league member gave up considerable help in 11 categories for lots of help in 1 category, with a little bit of help in 2 others (ERA and WHIP). He has traded 11 categories for 3 at most. Closers came and went in the next few rounds. People who took closers in rounds 10-14 missed out on drafting players such as Colby Rasmus, Casey McGehee, Curtis Granderson, Chad Billingsley, Brett Anderson, Vlad Guerrero, Wandy Rodríguez, Brandon Morrow, Jonathan Sanchez, Trevor Cahill, Matt Garza, Tim Hudson, Phil Hughes and Gio González. That’s a lot of talent to leave on the board so that you can sure up 1 category. I took my first closer in the 15th round. The reward for my patience was Matt Thornton. Thornton is closing for the Chicago White Sox. This is a team that will win 80-90 games, and Thornton could have a hand in many of those wins. His 2.67 ERA and 1.005 WHIP from last season are pretty impressive, and his 12 K/9 is better than all but 3 of the other closers available on draft day. I’m not saying Thornton is the best closer in the game, but I used the first 14 rounds to build a competitive roster and still got a great reliever who is going to close on a very good White Sox team. Rounds 15-21 produced 15 closers. Among the best chosen in these rounds were Brad Lidge, J.J. Putz, Chris P√©rez, Huston Street Joe Nathan, Craig Kimbrel amd Kevin Gregg. In my opinion, These guys give their fantasy owners just as much a chance to win the saves category than do those “elite” closers taken in the earlier rounds. One member of my league took Brandon Lyon and Kevin Gregg in the 19th and 20th rounds, respectively. He then snatched up part-time closer Jonny Venters in the 21st round. He now has 3 closers who will give him at least a chance to win saves just about every week, and he was able to build the rest of his roster with 18 rounds worth of picking the best available players. That Brings us back to the beginning of this post, and the man in the photograph: Joel Hanrahan. I drafted him in the 19th round, taking a chance on a new closer who was among the most electrifying relievers in the major leagues last season. Hanrahan had a 3.62 ERA last season and struck out 100 batters in just 69.2 innings. That 12.9 K/9, along with his solid ERA and 1.206 WHIP make him a candidate to help you win saves and not kill you in any of the other categories. Granted, Hanrahan closes for the Pittsburgh Pirates. They won’t win many games, but even 1 or 2 saves per week for Hanrahan could help any fantasy team sneak saves from time to time. The point of this post is this: Do not put too much emphasis on closers in the early picks of your fantasy draft. There are plenty of closers available late, and there are always closers available on the waiver wire throughout the season. Some closers went un-drafted in my league and are sitting on the waiver wire now. Other closers, like Brad Lidge and Brian Wilson, are starting the year on the disabled list. You could pick up their replacements to earn a couple of extra saves. Last year, Jonathan Broxton, Kerry Wood and others began the season as their team’s closer, but eventually were removed for better options. You could simply wait for a closer to lose his job and pick up his replacement for some extra saves. We all love bragging that we have Joakim Soria, Brian Wilson, or the great Mariano Rivera on our teams. These are great players. If I were building a major league roster, I’d love those guys. On my fantasy team, I’d rather have elite hitters and starting pitchers. Still not convinced? The person who has won my league the last two seasons had no closers last year, until the playoffs. He ended up picking up Brandon Lyon and Juan Guti√©rrez for his playoff run, and won the whole league. Not too shabby, right? And, in case you’re wondering, the team that had Mariano Rivera last season missed the playoffs all-together.